Work is like this old fable, The Wolf and the Crane. Westport Missouri, from the time it was formed until present day, has been a working class neighborhood. Wars have taken place, the burning of Mormons, the Mexican War, Civil-War, Women’s Rights and other notable history. Business continued despite these events. I write my blog from my house the trading post. The past owners of this property were young and old people. This building holds the ghosts of the pioneers, Indians, and business owners. Its greatest contribution to history is the fact that it just exists. It has to be noted that it is a wood structure. It is remarkable that the building has existed this long, despite the number of wars, battles, and fires that took place, and the capitalist nature of the city to knock it down and rebuild. And it survived Missouri weather. The history of Kansas City, too often discuss the same characters, like; McCoy, McGhee, Yoacham, Boone, Ewing, Vogel, Harris, Wornall, Hickman, Thomas Hart Benten, Samuel C Roby, Henry Clay Pate. Here is a short list of who had a trading post or tavern in Westport in the 1800s. It is important to note that this is not a complete census. The town was already, very big by the time the pre-civil war saloon, I live in, was built in 1853. The goal or lifestyle of the Westport Missouri residents would have been work. They were young working class men and women. Many of the first settlers would have been in their twenties. As the town grew successful and Kansas City dug away the dirt and flattened the cliffs along the Missouri river, these pioneer families grew wealthy and moved into new homes and buildings creating downtown Kansas City. The growth in downtown Kansas City established new public-houses and buildings; built in a wise manner, with a more expressive display of dignity, even though some of the establishments were for the distribution of spirituous liquors. This was the nature of the city, and has been ever since. Kansas City tends to invest in a new construction project, often centered on building another shopping and entertainment area, and then new construction for residential housing communities. Problem is, we haven’t run out of land. Kansas City has about 116 square miles of real estate. In Kansas City we don’t build up, we build out. Creating older communities that struggle for business. New city projects always bring in the newest technology, however, the consumer only needs the basic comforts from life. To maintain a reasonable life-style I must work forty plus hours a week. The hours each day reserved for work are not my favorite. The work day begins at 5:30 am when the alarm goes off. I have to work at waking up. It is my habit to push the snooze until six or six thirty. I could stretch it to seven but then I wouldn’t get breakfast or have time to pack a lunch. I plan my lunch the night before. I usually have it set aside, in one area of the refrigerator. The extra time allows me to make last-minute changes as I fill my lunch bag in the morning. I have to follow a routine to get through the hurried work morning. I shower, dry hair, moisturize, and dress. My wardrobe picked out the night before, it doesn’t have to be dressy. I choose between a blue or black, or pink uniform, and if they are dirty, I wear jeans. I prefer to wear the hospital uniform because I work in a laboratory. I perform medical testing, and I splash a lot of serum. If I’m in my scrubs when I get home, I remember I am still contaminated, but when I’m in my jeans I get comfortable, and forget I may have blood splashes on my cloths. Ack!! By 7:30 am I am on the highway. I start the first mile or so at normal speed. By 7:37, traffic is 20 mph. I have never figured out why each day traffic slows to a crawl for several miles. Then a few minutes later I’m traveling the speed limit again and there is my exit. I manage to get into the parking lot at 7:57, my shift starts at eight. On Saturday’s shift, I get to work fifteen minutes earlier, because there isn’t any traffic. My work days, at the laboratory, vary between Monday through Friday, or Tuesday through Saturday. By 9:00 am, I am homesick. But I don’t let on. I blow my nose, and keep looking for specimens. The morning is slow. Not many doctor offices have sent in any specimens, we are just working on orders that were added on, overnight. This is the hard part, the blood specimens have been put into a numbered order in the walk-in refrigerator. Some associates love the cooler, I hate it. But I’m responsible for the chemistry testing and must find seven specimens, in seven different boxed compartment, in the cold. My white lab coat provides some warmth. Burr! The first weekend of every month I coach/teach a girls modeling class. A very long weekend. I feel kind-a catatonic. Zombie-ish. I try to incorporate some of that positive thinking I teach the girls, but I get tired, tired, tired. Then I don’t care, and find conversing to be a chore. Believe it or not, I like my jobs…but when striving to make another person a buck, I wonder about a lot of things. Like, why am I here? Then it is ten in the morning, and I smile, because it is break time. I leave my white jacket on the chair, and I go to the little room that contains the only clean sink and food worthy refrigerator. I have fifteen minutes. In my pocket, I set my phone timer. During this time I wash my hands, blow my nose, wash my hands, go to the toilette, wash my hands. I nibble on fruit, salami, and cookies, while I guzzle a coke-cola. My stomach gurgles, and I give a small belch. A silly little tone vibrates from my pocket, it is time to go back. Later, I’ll take a thirty minute lunch and if time allows another fifteen minute break in the afternoon-right before I go home for the day. A few of those specimens will not get done tonight. The laboratory manager will be tense and I do not want to tell the doctors whose test results will be delayed. The lab will open at four in the morning and start the whole process all over again. The work day may bring the blues, but the treasures within this house can almost always brighten my mood. In my bed cloths I move from room to room in this huge saloon from long ago. I carry a load of laundry through the house. I put the load of dirty cloths in the washer. I drop a quarter into the juke box. 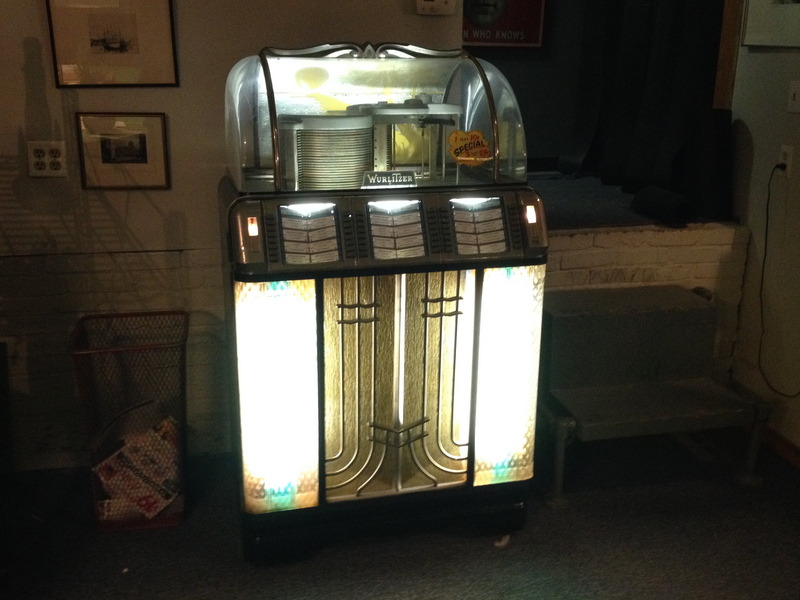 A 1954 Wurlitzer plays my selection, “The Lion Sleeps Tonight.” With no one in sight, I dance and sing along. At work I have my I-phone tunes, but at home I have the treasures the wolf left behind.